The metal scenes in Europe and the United States have always had a symbiotic relationship. When one scene moves in a particular direction, the other one begins by emulating and then transcending that direction. The New Wave of British Heavy Metal was a profound influence on the American thrash metal scene, a scene which would greatly influence musicians all over Europe (e.g. Swedish death metal), and so on. To make a (very) broad generalization: Europe tends to bring the mythology and romantic mystique; America tends to bring a more self-oriented, personal touch. This is true of the American black metal scene as well. 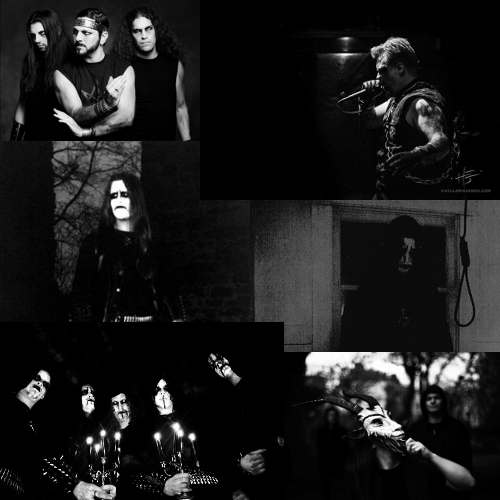 A good introduction to United States Black Metal (USBM) requires an appreciation for the bands that began by directly emulating the stylistic giants of Scandinavia, Switzerland and elsewhere. True, the American scene has gone in all sorts of directions since its development in the mid-to-late 1990s. But listeners should have a sense of context before moving into the specialized realms occupied by death-laden heroes like Goatwhore and Hod, along with the indie/alternative influenced sounds made famous by Wolves in the Throne Room. So with that in mind, enter the Nine Circles ov USBM. In classic black metal fashion, Absu started as more of a death metal band, evident in the howling dirges present on 1993’s excellent Barathrum: V.I.T.R.I.O.L. But on 1995’s The Sun of Tiphareth, there are clear influences of bands like Rotting Christ and Varathron that throw a black metal shade over the band’s sound. Since then, the band has explored all manner of mythological subjects and dazzled audiences with their fantastic live performances. I saw them open for Immortal and couldn’t believe the singer was also the drummer! The creation of sole musician Akhenaten, Judas Iscariot is perhaps America’s most explicitly Scandinavian-style black metal band. Take the vocals of Immortal, the songwriting approach of Transylvanian Hunger and Panzerfaust-era Darkthrone and the atmosphere of the early Burzum records, and you’ll have a good handle of albums like Distant in Solitary Night and Thy Dying Light. And now for something much more upsetting. Once again, Profanatica was originally started by three former members of Incantation, giving them clear roots in American death metal. But Profanatica took a much blacker turn, and probably did so before anyone else did, their Weeping in Heaven demo even predating VON’s legendary Satanic Blood demo. Profanatica has a big, menacing sound, reinforced by multiple instruments playing the same notes in unison (albeit in different octaves) to add to the ferocity of their most unholy of styles. Then again, Demoncy predates anyone else on this list, forming in 1989. The minute you turn on albums like Joined in Darkness, or last year’s excellent re-recording and beefed-up edition of Empire of the Fallen Angel (Eternal Black Dominion), one word immediately screams out: Beherit. Demoncy is not unique in this regard, with many early USBM acts taking an explicit liking for Drawing Down the Moon. In Demoncy’s case, Ixithra and crew specialize in creating a mysterious blend of magic, despair and foreboding that wraps the listener deep within it’s dark wings. Moving into some more well-known names, Krieg is the first band on this list to occupy a more “American” space. By that I mean they talk more about everyday, personal topics. Of course, Neill Jameson (originally going by the name “Imperial”) originally steered the band into more traditional black metal waters with Rise of the Imperial Hordes and Destruction Ritual. But in 2004, Krieg gave audiences The Black House and began to delve into more universal topics like madness and misanthropy. Speaking of madness. Leviathan has become the standard for dark, tortured black metal that explores every aspect of self-hatred, suicide and the torture of having even been born. And though Jef Whitehead (aka “Wrest”) has since written critically acclaimed albums like Tentacles of Whorror and Scar Sighted, nothing quite reached the depths of human despair quite like this song from 2003, especially the haunting piano section in the middle. Well, that is, except for this. If you’re interested in learning more about the minds behind Xasthur and Leviathan, I highly suggest you check out Vice’s documentary, One Man Metal. It’s easy to scoff at the idea of metal being “spooky” and eerie-sounding in 2016. There is nothing to scoff at here, only amazement that an artist could distill the feeling of hatred for mankind and the self so perfectly. Moving our heads (ears particularly) out of the depths and up through the woods and the stars, we reach the Bergtatt-worshiping sounds of Oregon’s Agalloch. The drama behind their recent breakup aside, I think Agalloch deserves to be honored as one of America’s guiding lights of black metal. For our purposes, I decided to lean away from the folk and acoustic side of their catalog and focus on the heaviness of this track of their brilliant swan song in 2014. To end within the same motif, here is one of my favorites from Panopticon, one of the most prominent and talked-about black metal bands in the modern scene. The pair of creative minds, both named Austin Lunn (! ), specializes in moving, emotive songs that manage to preserve black metal’s power and edge while moving it into captivating territory. More than any other black metal band, even those being momentarily fawned on by indie publications, Panopticon is the ideal example of letting black metal expand and evolve while still remaining black metal. Imagine that? You can’t be serious about the two Austin Lunn’s thing. Panopticon is the very definition of a solo project. The source of your confusion however may be that there is another Austin Lunn, whose only involvement in Panopticon so far is that he recorded the first album nearly a decade ago.